The engine is a ‘New G’ class 0-8-0, one of sixty built at Crewe Works in 1910. The design was the same as the ‘G’ class or ‘Piano G’ class, which was so designated as it was the next design after the ‘F’ class, and was a rebuild of the ‘B’ class four-cylinder compound 0-8-0s to simple operation, in which the outside high-pressure cylinders were removed and the inside low-pressure cylinders were retained and supplied with high-pressure steam direct from the boiler. The ‘piano front’ of the compounds was retained in the rebuilds but was dispensed with in the ‘New G’ class. No. 1385 was built at Crewe Works in June 1910, its ‘plate date’, the date on its number-plates, was July 1910 and the date it was put into stock - according to the Monthly Alterations - was August 1910. It was sent to France for service with the Railway Operating Division on 1.5.17 with tender No. 902 and returned to UK on 9.6.1919. (see Table 2 on page 72 of Eight-Coupled Goods Engines; this table was based on the Scott-Walsh papers in Stockport Library). The track visible in the photograph seems to be flat-bottom, so presumably the photo was taken in France. 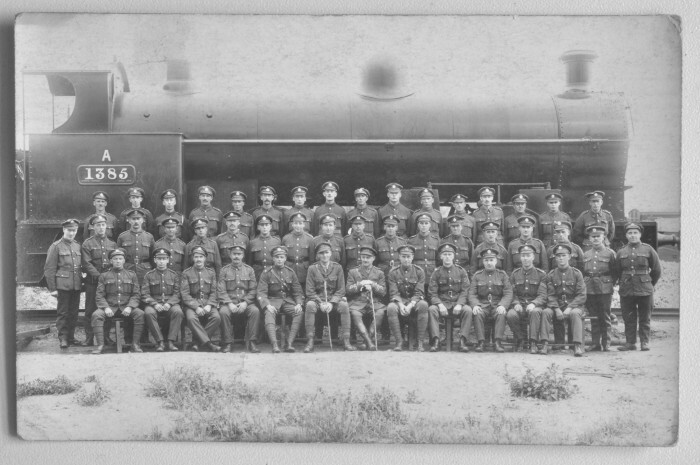 The men posed beside the engine are presumably a unit of the Railway Operating Division. But where is it? Who are the men posed in front of it? Why was the photo taken? Any other information? The men are Royal Engineers as seen by the cap badge, and the ROD was part of the RE. I would suggest that the photo was taken in 1919 just before the Company/platoon they belonged to was demobilized for return to the UK. The Australians certainly did so, and this was probably intended was a memento of their service. Presumably this is just a group photo of a Company, or Platoon (I don't know how the R.O.D. was subdivided) of 46 men, including two officers in the centre, flanked in the front row by the NCOs. With a handy loco as background to suggest what their duties were. When I was conscripted into the Airforce, a similar photo was taken of our group of recruits ("26 Flight"), with a Wellington bomber as background, although it was just one of several old planes which decorated the camp, miles from any airfield. And at that stage we had nothing at all to do with aircraft - but it looked impressive. No doubt some of these ROD chaps "somewhere in France" had more actual contact with locos, and I expect some of them had just spent hours cleaning and polishing No 1385 for the photo. Although this photograph of No. 1385 was almost certainly taken in France, it is worth pointing out that locomotives stationed at Chester and Carlisle specfically for Admiralty coal traffic, carried a letter 'A' to denote that they were reserved for this purpose. It might be possible to check the steam shed No. 1385 was allocated to prior to being sent to France on 1.5.17, if the records exist. The code letters on the cabs of many ROD locos in France has been covered by Bill Aves in his excellent books on the subject of the ROD. They are understood to indicate the allocation of the loco although the exact translation is not known. A is thought to relate to Audruicq. Other letters known to have been used include B, D, H, N, & R.